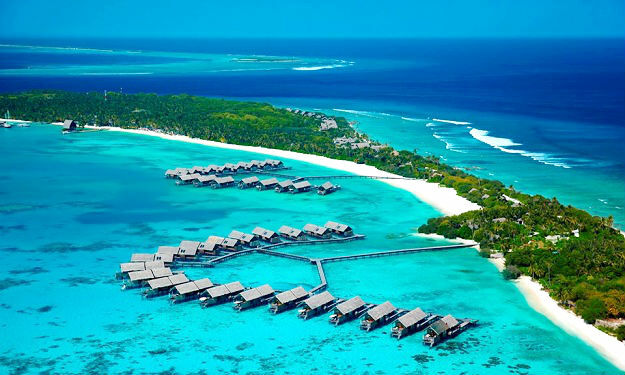 Jumeirah Dhevanafushi Maldives five star deluxe resort offers luxurious vacation in villas with private pools, steps from white sand beach, clear water and lagoon. 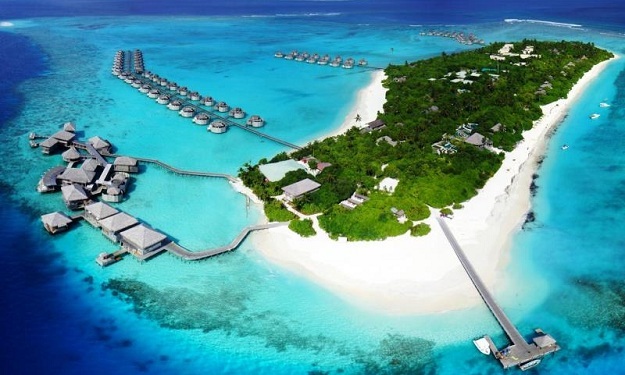 The resort is hidden away on the southern end of the Maldives, on the Gaafu Alifu Atoll. 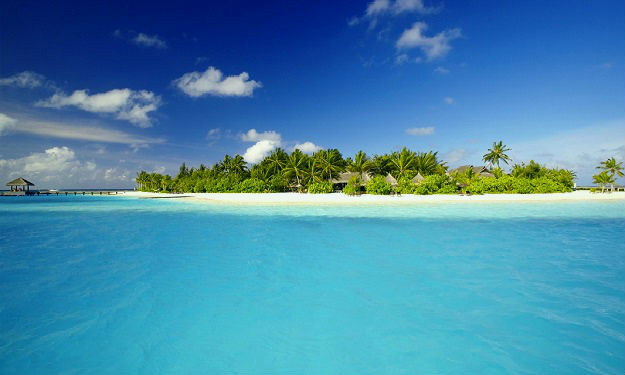 Get a bird’s eye view of this incredibly country as you fly over islands on a 55-minute domestic flight from Male to arrive at the Kaadedhdhoo Airport. Arrive at the resort by a 20-minute speed boat ride. 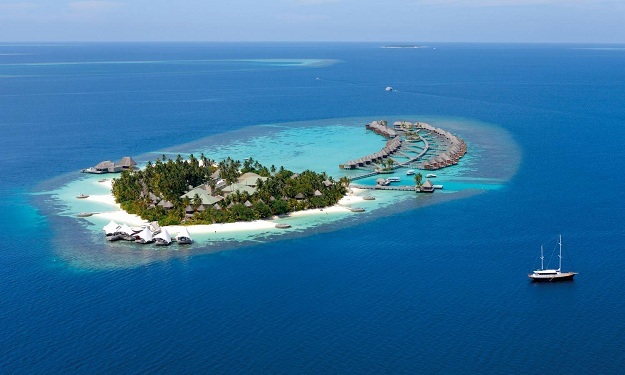 Spacious villas at Resort Dhevanafushi Jumeirah with great privacy is a added advantage for couples and honeymooners to hide away the romantic wow moments in their holidays. The Beach Revive Villa with Private Pool is an enchanting experience, seducing you with sweeping spaces, personal butler service and breathtaking sunrises. The interior offers you a bright and inviting environment in harmony with nature including high ceilings and parquet, framed by a panoramic view of the ocean. Relax on deck around your own private pool or take a rejuvenating outdoor rain shower. A night stroll to the hotel’s private stretch of beach is a magical star-watching journey, knowing that a magnificent four-poster bed awaits you. 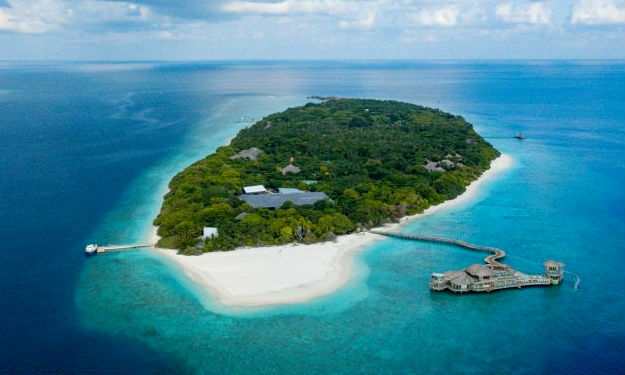 The Beach Island Revive Villa with Private Pool is a dreamlike space where your cares will drift away. Enjoy convivial moments in the living and dining area, surrounded by panoramic picture-perfect views of the ocean. 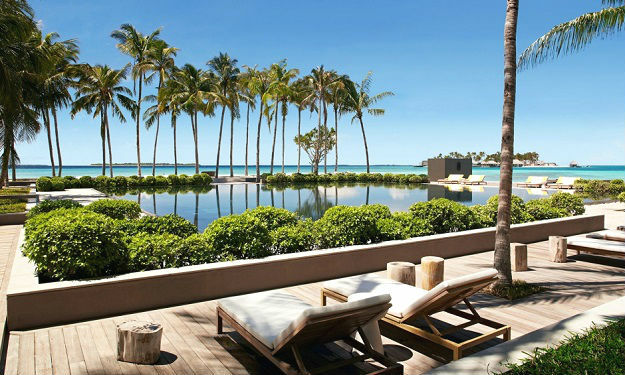 Your own vast private garden and pool await you, extending the promise of pure play and relaxation to the exterior. 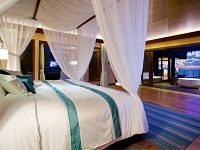 Personal butler service, exclusive beach access and the Maldives’ largest beds complete your vision of an ideal stay. 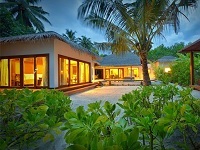 The Two Bedroom Beach Sanctuaries Sunrise are luxury two bedroom villas offering privacy and tranquillity. The second bedroom includes an en-suite bathroom and shower area, with access to the outdoor maxi-bar and seating area. Stylish and relaxed bathroom with marble finishing, walk-in shower with separate outdoor marble plunge bath, walk-in wardrobe and outdoor rain shower, including luxury bathroom amenities. 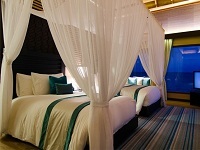 The Beach Sanctuary Sunset villas are two bedrooms offering privacy and tranquillity. The second bedroom comes with its own ensuite bathroom and shower. 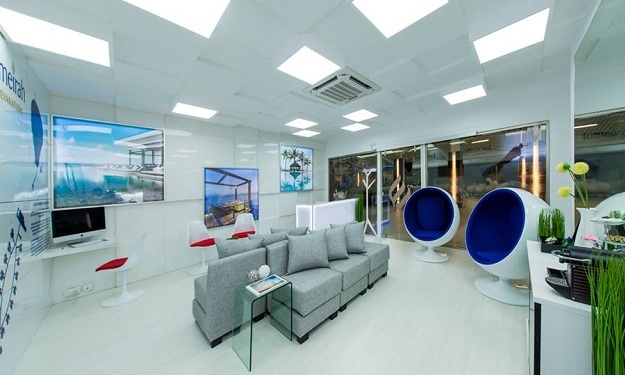 There is also a TV and multi-media area and access to an outdoor maxibar and relaxed seating. As you would expect, the Beach Sanctuary Sunset villa offers a luxurious vantage point from which to enjoy each glorious sunset. The Ocean Revives villa offers an elevated sense of splendour, perfectly positioned to catch magnificent sunrises and uniquely built directly over the Indian Ocean’s waters. Vast interiors in soothing hues will delight you, from the convivial living and dining area to the tranquil bathroom, all with stunning panoramic views. 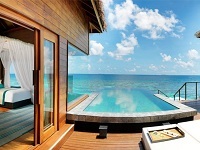 Step out onto your private deck and choose between a journey into the ocean or dive into your exclusive pool. Butler service will ensure your every requirement is attended to. 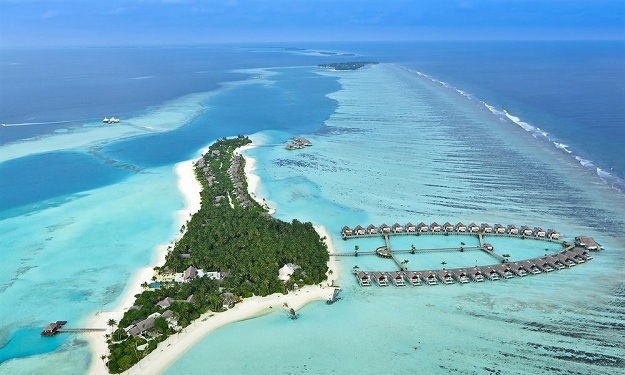 Ocean Revives at Sun set , a truly sublime retreat for the most discerning luxury traveller. 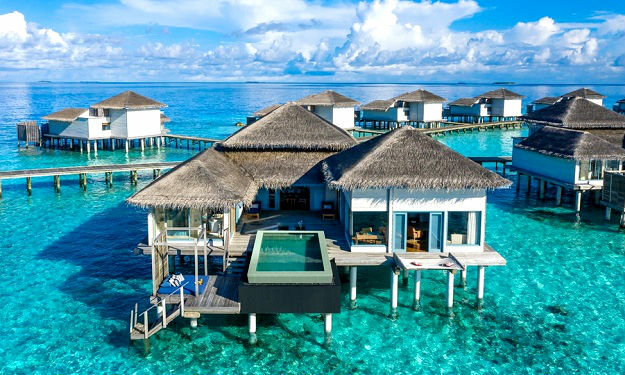 Built above the crystal waters of the Maldives Islands Ocean, this beautiful Ocean Revivesoffer an elevated sense of splendour with soothing hues and vast interiors, perfectly arranged by covered private decks with steps leading into the ocean. 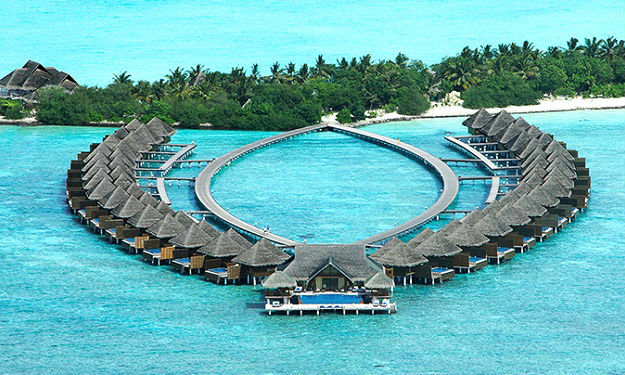 Perfectly positioned to catch magnificent sunrises and uniquely built directly over the Maldives islands crystal clear waters. From the convivial living and dining area to the tranquil bathroom and stunning panoramic views from the villa. Step out onto your private wooden deck and choose between a journey into the ocean or dive into your exclusive fresh water swimming pool. Unlock your every fantasy at these two magnificent Ocean Sanctuaries, perched on platforms above the most iridescent sea in the world. With stunning views of dazzling Maldivian sunsets, you are surrounded by beautiful details and unparalleled luxury, which resonate to your every sense. With generous interiors, traditional Maldivian designs, private decks and indulgent marble baths, this is the epitome of everything exquisite. 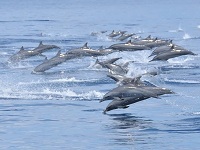 These two magnificent over water Ocean Sanctuaries. The Two Bedroom Ocean Sanctuary Sunset with Private Pool promises to surpass your every fantasy. 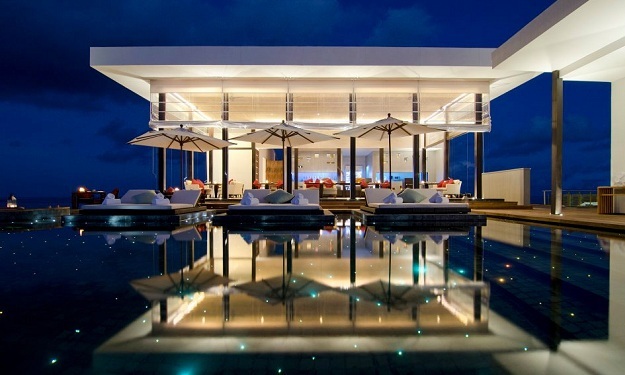 A one of its kind property, perched above the world’s most iridescent waters and privy to magnificent sunsets. Exceptionally spacious, its interior decor is ocean life inspired to create serenity and harmony, while the marble bath features will resonate with your love of luxury. 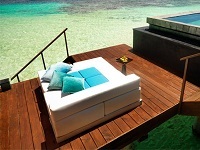 The private deck extends a welcome to the ocean or a moment in your exclusive pool. The luxury of Talise Spa finds a particularly tranquil setting at Jumeirah Dhevanafushi, where its signature spa experience overlooks the Maldivian coastline. A holistic approach to wellbeing reconnects you with nature, with signature treatments delivered by expert spa therapists. Romantic spaces for couples offer intimate moments of true relaxation, while extensive spa menu offers individual treatments tailored to your needs. Whether it’s a deep tissue massage or a purifying facial take you on a journey to meet a calmer, more relaxed you. 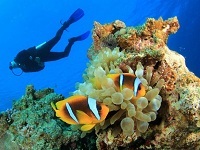 The PADI certified Best Dives dive centre provide a wide array of courses and expeditions. Please speak to resort professionals on your preferences and they will help select an activity that’s right for you. 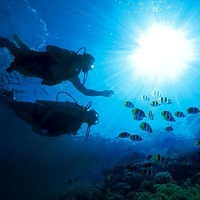 From snorkeling and scuba diving for beginners, right the way through to courses for professional dive instructors, The Best Dives Dive Center at Jumeirah Dhevanafushi has the expertise to make sure your experience is everything you hoped. 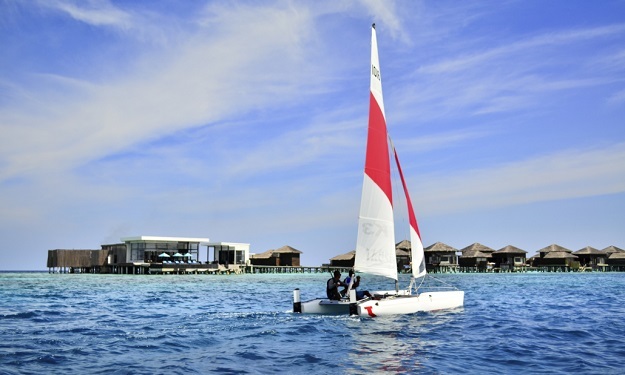 Try out the exhilarating array of water sports activities on offer at The Best Dives Water Sports Center at Jumeirah Dhevanafushi. Whether it is Kite Surfing, Wake Boarding or the Sea Bob, you are sure to have an adrenaline rush throughout the day. The resort qualified instructors are on hand to take you through the fundamentals or to conduct in depth courses. 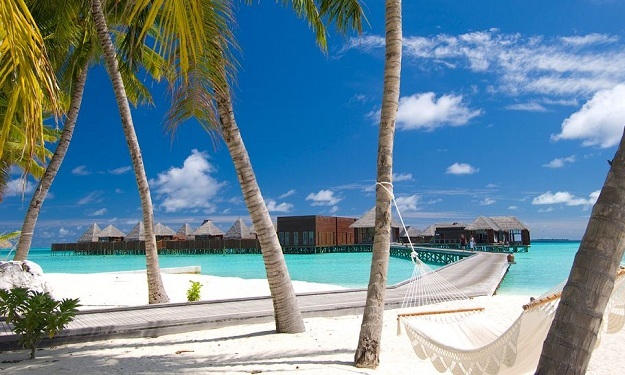 No matter your proficiency, there is something for everyone here at Jumeirah Dhevanafushi. A range of Water Sports to enjoy: Banana Tube, Catamaran, Sailing, Fun Tube, Kite Surfing, Sea Bob, Wake Boarding, Water Skiing, Wind Surfing. Local Island Visit: A short boat ride will take you to a local village, where the fishermen have been residing for generations. Discover the Maldivian culture from upclose, while strolling through the narrow streets or purchasing souvenirs from resident craftsmen. 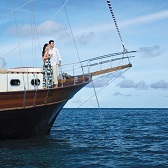 Sunset Cruise: Enjoy the beautiful Sunset on the Indian Ocean with a glass of champagne & canapé on one of our Dhoni’s. The state of the art over-water gym provides a challenging and rewarding space to enable a healthy balance during your stay. 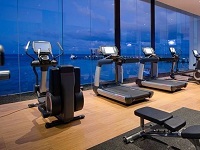 Draw inspiration from panoramic views of the Indian Ocean as you use first class equipment designed to help you achieve your fitness goals. Or take a private or group yoga class on the deck of the Talise Spa with trained professionals. (Yoga class subject to availability). 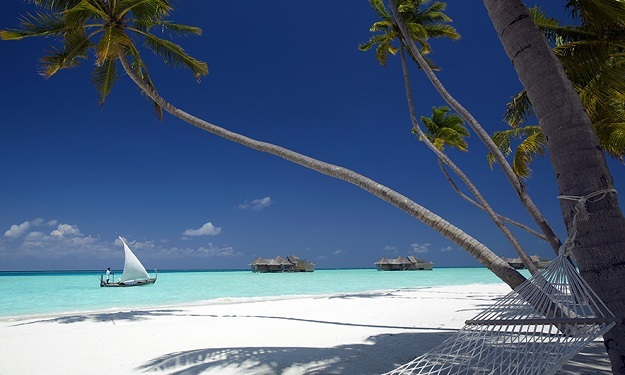 When choosing a wedding or honeymoon venue in the Maldives, the choices are infinite. But only one venue can offer a truly seamless blend of inspirational luxury, exemplary service and total focus on your needs and wishes. 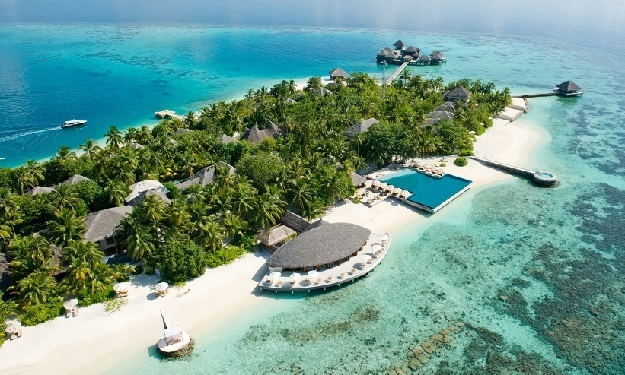 Jumeirah Dhevanahushi is an exceptionally beautiful setting for this momentous scene in your love story. 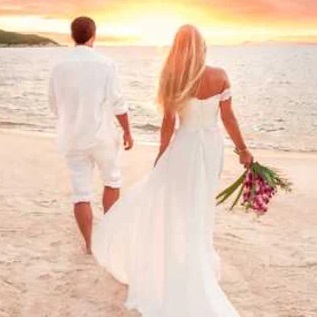 Whether you are planning your wedding the Jumeirah Dhevanahushi resort experienced and dedicated wedding coordinators will offer their support and expertise, working with you to plan the celebration you have always dreamed of. 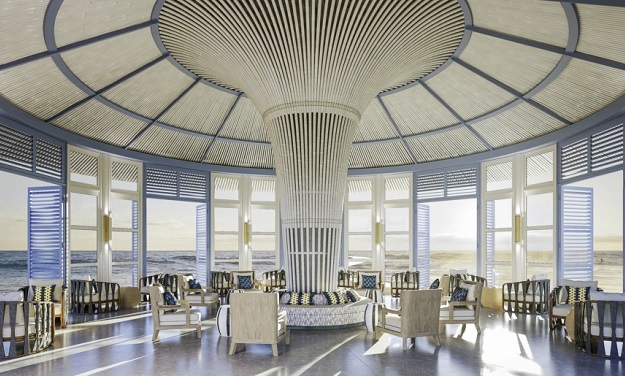 A collection of beautifully designed spaces, relax and appreciate the tranquility of the Azara beach and enjoy the breathtaking views of the Indian Ocean. Azara is the perfect place to enjoy the freshest and most exiting cooking all day long. From a lavish breakfast of freshly baked pastries, fruits, hot and cold dishes, to tempting lunch and dinner a la carte menus, Azara is a celebration of an exciting menu executed perfectly. Indulge yourself in an interactive cooking class with international team of chefs in the midst of a culinary herb garden or enjoy dining at the chefs table complimented with a specially tailored menu. Restaurant Description The chef is on hand to guide you through the broad menu, introducing a range of the freshest ingredients, while the sommelier stands close at hand to offer advice on your vintage of preferences. Let time unravel seamlessly as you enjoy delicacies prepared to your individual taste buds in this tranquil corner of paradise. Breakfast A’ la carte Lunch / Dinner Lounge dining with contemporary Mediterranean cuisine complimented with a variety of refreshing cocktails made to suit your mood, whilst you relax by the infinity pool, watching the splendid horizon. 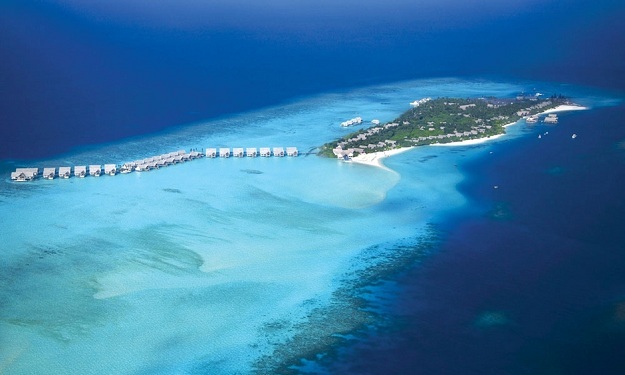 Watch all the colours of a Maldivian sunset from the vantage point of scenic Khibar. An extensive cocktail menu makes every drink a masterpiece, with home-infused vodkas and expert combinations created by own master mixologist. Enjoy dinner under the stars at this culturally connected beachside restaurant, which offers fine dining against the splendour of the Indian Ocean. 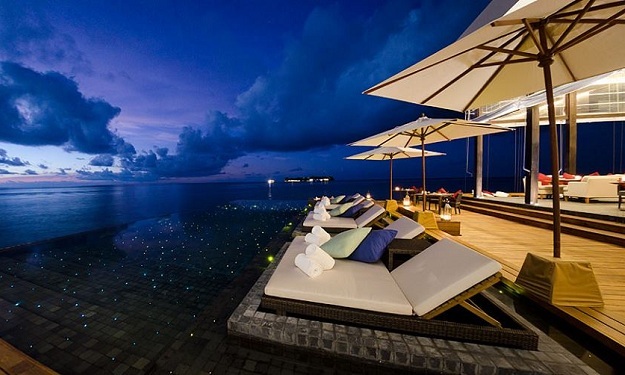 The soft white sand at your feet and bright night sky overhead sets the scene for gastronomic indulgence at Mumayaz restaurant in the Maldives. Embark upon a journey of discovery at weekly "Maldivian Night" at Mumayaz restaurant- an evening of tradition and celebration where sumptuous local cuisine is on offer as you are entertained by the “Bodu Beru”drummers.